With Solab’s on-site training services, our IT expertise comes to you. We plan and deliver courses on client premises in Aberdeen and across Scotland. It’s a cost-effective and highly efficient alternative. Your personnel are using IT systems, files and applications that are familiar to them in their everyday work - and course content can be customised to make it directly relevant to your organisation. We offer ‘closed’ courses for companies looking to train more than one person on the same subject. These private courses are delivered to a maximum of ten delegates at your premises. We can tailor the materials to cover specific topics, and incorporate your data into relevant areas of the course. And it’s a cost-effective solution: the more people on the course, the cheaper your per-delegate costs. Our portfolio of standard and premium courses covers a wide range of applications and systems. But we know there’s not always a perfect fit with your business objectives and learning requirements. That’s why we’re always ready to devise and deliver a course specifically for you. We have vast experience in tailoring existing courses or creating entirely new ones to suit your precise purposes. We can incorporate your business files, templates and databases to make the training experience relevant and authentic. Get in touch with our Solab training team to discuss your requirements! These days many people already have some computer skills – which means ‘off the shelf’ training isn’t necessarily the best way to acquire additional knowledge and it may be even more time consuming attempting to teach yourself through the use of Google. That’s why we offer one-to-one training, either in-house at your offices or at our own premises in Aberdeen. One to one training allows you to go at your own pace but learn the correct methods, which in the long run will save you time! Our flexible approach allows you to focus on what YOU really need to learn and we can use your live examples. To arrange an informal chat to explore the possibilities for you or your business, please get in touch with our SOLAB training team! Your on-site training expert. There’s an extra dimension to our specialist IT training services: soltrainer. We create an on-site staff development programme for you – and assign a dedicated and experienced trainer to deliver it across your business. We’ve got a fast-track solution that will allow you to learn what YOU want, quickly. You don’t need a full one-day training course in order to meet your learning objectives. By eliminating unnecessary topics and delivering short sharp bursts of expert training, we teach you exactly what you need to know with no hassle, when you want. It’s a focused and targeted approach, delivered via either a one-off session or a specially developed personal training programme. We want to offer you maximum flexibility in IT training. With our fully equipped training centre at our Aberdeen offices, we’re able to do precisely that. It can accommodate up to ten delegates and features high specification, fully networked wireless laptops with shared printing, as well as flipcharts, SMART boards and projectors. We take care of administration and bookings, and make sure everything’s ready for the day. Our experienced trainers deliver need-specific sessions. No interruptions and no distractions, just an engaging training environment that supports your continuous learning agenda and improves your business productivity. If it makes commercial or logistical sense for you to send someone to our open courses, there are plenty of options on offer. We run a variety of one-day courses each month on desktop applications and systems, at levels covering everyone from beginners to IT experts. We offer ‘closed’ courses for companies looking to train more than one person on the same subject. These private courses are delivered to a maximum of ten delegates at our training school in Aberdeen. We can tailor the materials to cover specific topics, and incorporate your data into relevant areas of the course. And it’s a cost-effective solution: the more people on the course, the cheaper your per-delegate costs. Our portfolio of standard and premium courses covers a wide range of applications and systems. But we know there’s not always a perfect fit with your business objectives and learning requirements. 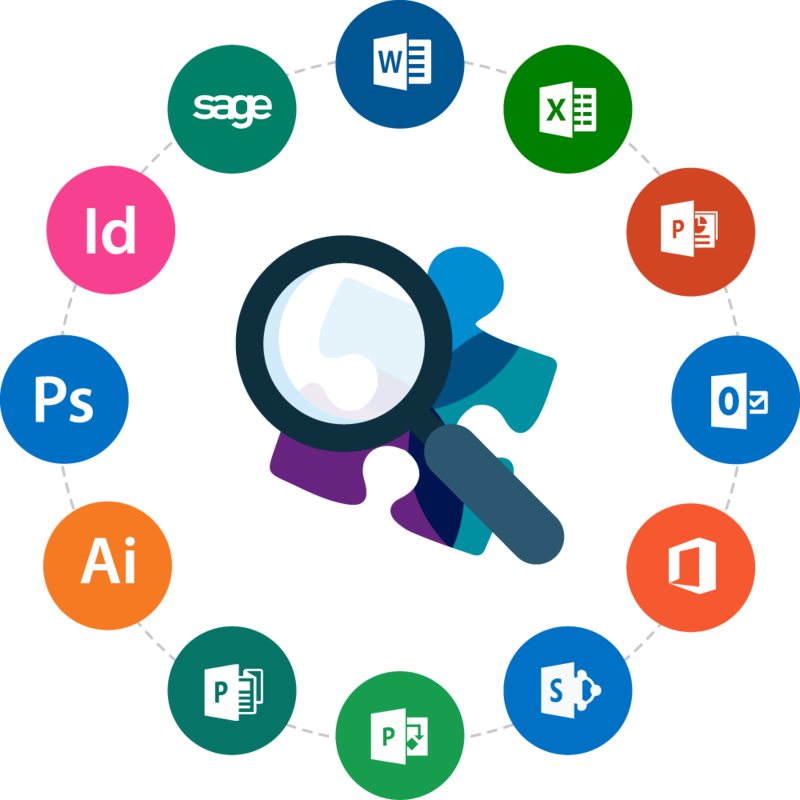 If you want to make full use of your Microsoft applications and inject new productivity into your operations, we’ve got a fast-track solution. It doesn’t need a full one-day training course to build up the competencies needed. By eliminating unnecessary topics and delivering short bursts of expert training, we teach delegates exactly what they need to know. No fuss, and no waste of time. It’s a focused and targeted approach, delivered via either a one-off session or a specially developed personal training programme over a series of bespoke sessions. These days many people already have some computer skills – which means ‘off the shelf’ training isn’t necessarily the best way to acquire additional knowledge. That’s why we offer one-to-one training, either in-house at your offices or at our own premises in Aberdeen. Whereas training is primarily working with someone to give them a specific skill, coaching is working with you so that you identify for yourself what is in the way of you moving forward and becoming more effective. This way, you will learn and remember more, more quickly. You will also use what you have learned for longer periods. In today’s fast-paced business environment, we know you’re looking for new ways to train your people: smarter alternatives that boost workplace productivity. It’s why e-Learning is an attractive learning solution – and why we’ve developed a range of courses that are delivered online. It enables you to train your staff on the right applications, at a time that suits – and at a very competitive price.